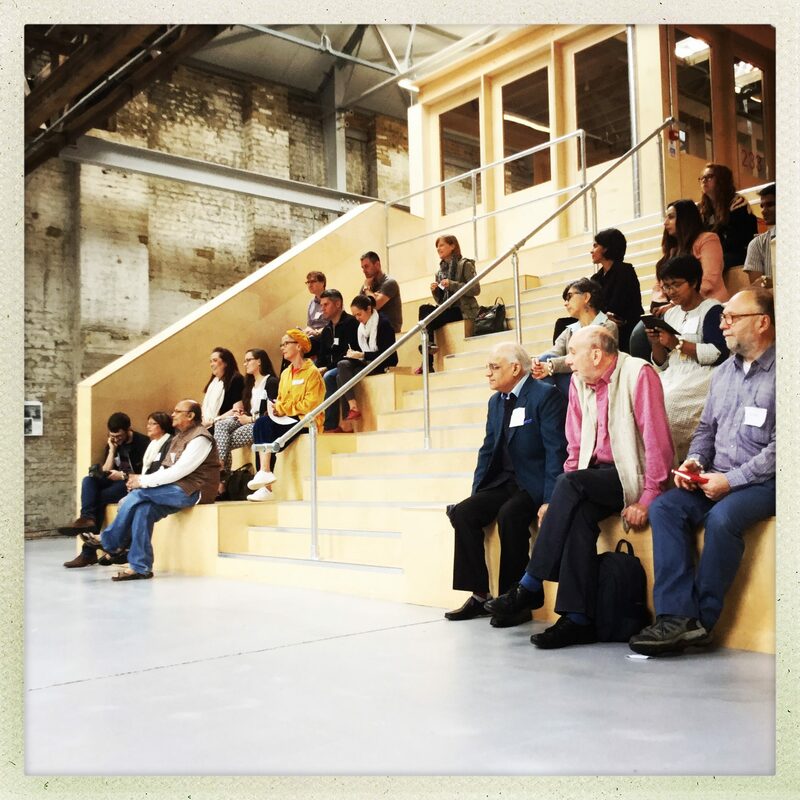 Participants from across continents gathered early in September 2018 to continue a conversation about how textiles can become a force for good. Attendees at the event represented a cross section of the industry, farmers, suppliers and producers, emerging fashion brands, craft representatives, consumers and campaigners. The tone of the conversation during the day was on finding solutions and building networks. These took place in panel discussions, around demos and exhibitions, in craft workshops, at stalls which showcased ethical products, and over cups of tea and helpings of samosa chaat. For the Khadi Initiative, Saturday, September 08, 2018 marks an important landmark in its brief history. 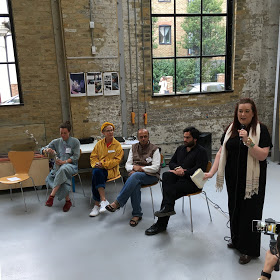 The day brought clarity about the initiative’s mission and future direction – to provide physical and online spaces for experience sharing, dialogue and networking – all aimed at making textile and fashion a vehicle for change. The festival searched for solutions – solutions on how textile and fashion can become a force for good and a vehicle for change. 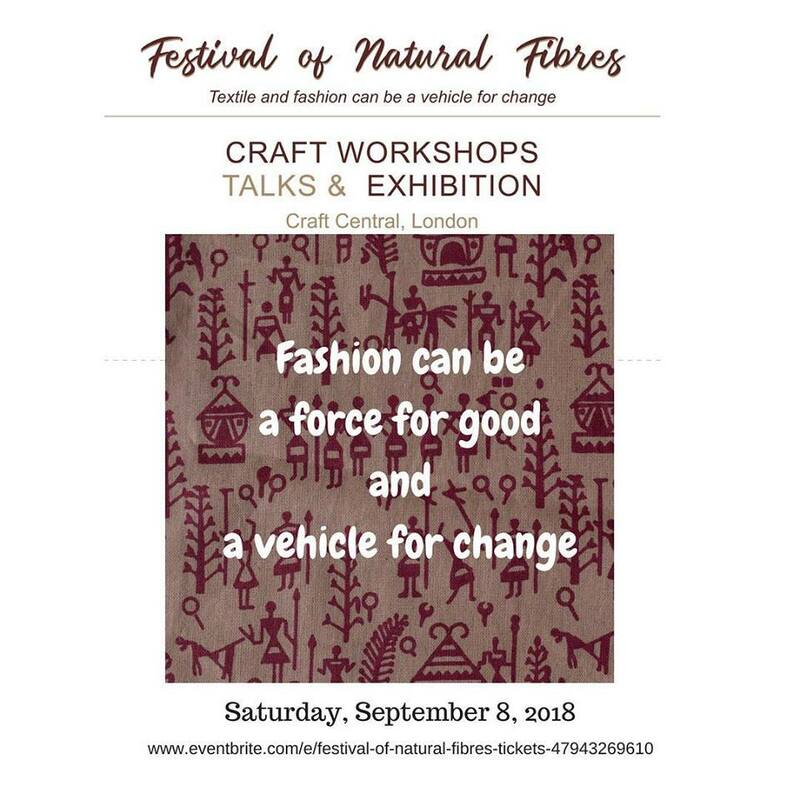 The event on the 8th was part of of the Festival of Natural Fibres between September 5th and 9th at Craft Central, a stunning venue for events and craft studios on the Isle of Dogs, London. The festival was organised by the Khadi Initiative and facilitated by Freeweaver Saori Studio. Saturday was the high point with more than a hundred people visiting, some from as far away as India, Switzerland and Germany, to learn find solutions and network. Cotton, wool flax and hemp dominated at formal panel discussions which took a note of an increasing interest in natural fibres and focused on how to build on this interest. This marked an important shift for the Khadi Initiative, from a narrower focus on khadi (the hand spun and handwoven fabrics of India) to bringing together all initiatives promoting natural fibres as an alternative to the growing menace of plastics in our textiles and clothing. Not a sudden shift but part of an organic growth of a movement began in early 2017. 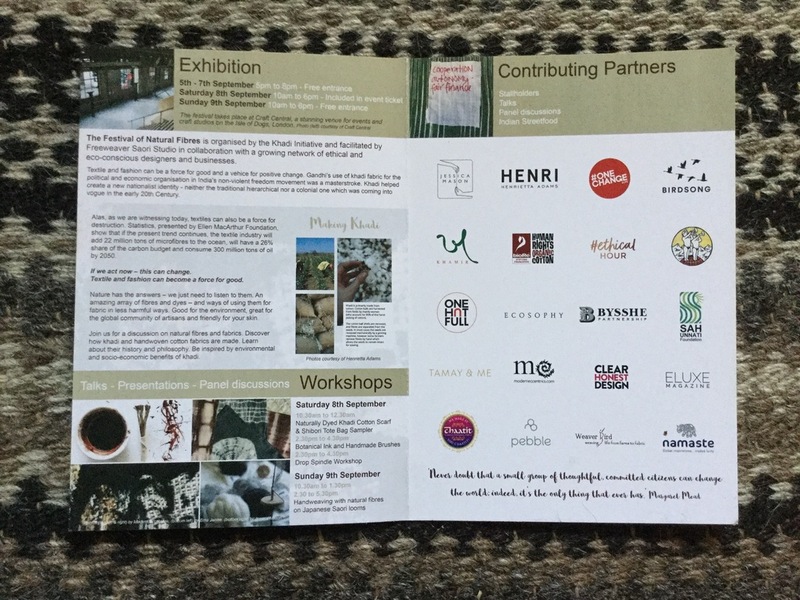 Five like minded organisations, Khadi CIC, Moral Fibre Fabrics, Where Does It Come From?, Action Village India and Fresh Eyes: People to People Travel – joined forces to found the Khadi Initiative and organise an event – A Way Ahead: Ethical Khadi on November 2017. 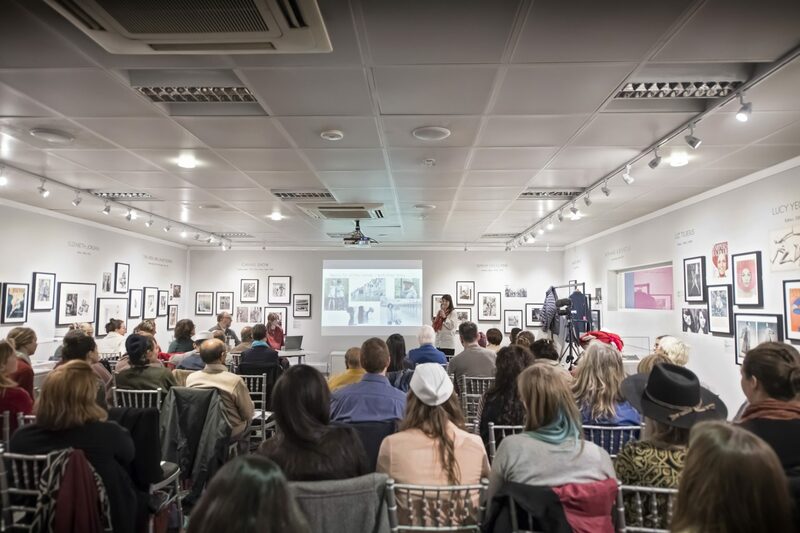 Held at a prestigious venue, London’s Fashion and Textile Museum, the event was host to over one hundred exited people from all walks of life – including designers, producers, brands and charities. About a hundred people attended the event AWA:EK, generating a sense of movement for natural fibres. 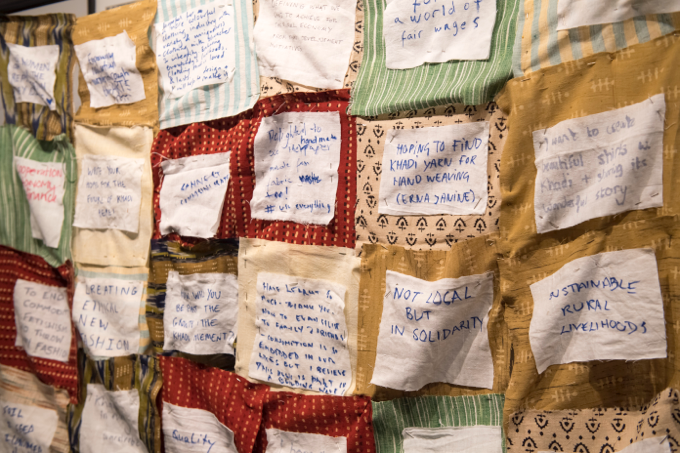 The event generated a sense of a movement – heightened by a collaborative creation of a ‘Khadi Patchwork of Dreams’ Attendees wrote their dreams for khadi upon khadi patchwork squares, before pinning them to create a large patchwork. This beautiful piece of khadi art symbolises the collective effort, energy and enthusiasm of speakers and attendees at the event. There was a sense of consensus around principles and future directions. Since then the movement has grown. Individuals and businesses who want to bring about generation defining social change through fashion and textiles have joined in. People who believe that fashion can be a force for good and a vehicle for change. It has succeeded in bringing together people from different parts of UK and from around the globe. 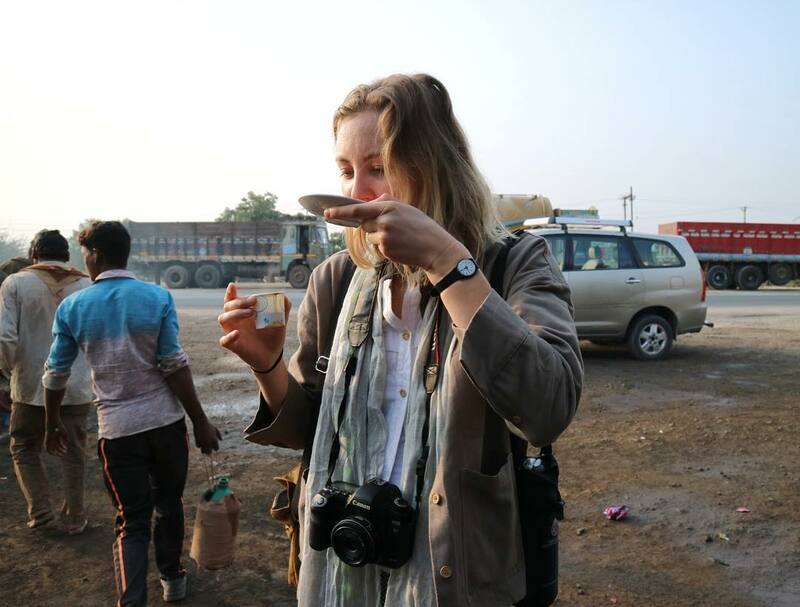 Soon after AWA:EK, the Khadi Initiative helped organise tours for designers to get a first hand experience of supply chain in India – from farmers to tailors. Social media posts from these visits helped in generating further interest and keep the momentum going. It wasn’t a one way traffic. Within a very short period time we have interacted with visitors from India and Switzerland. We have helped them make new connections or strengthen old ones. Kapil and Medha who had helped with the visits in India came to UK as part of a two country tour. 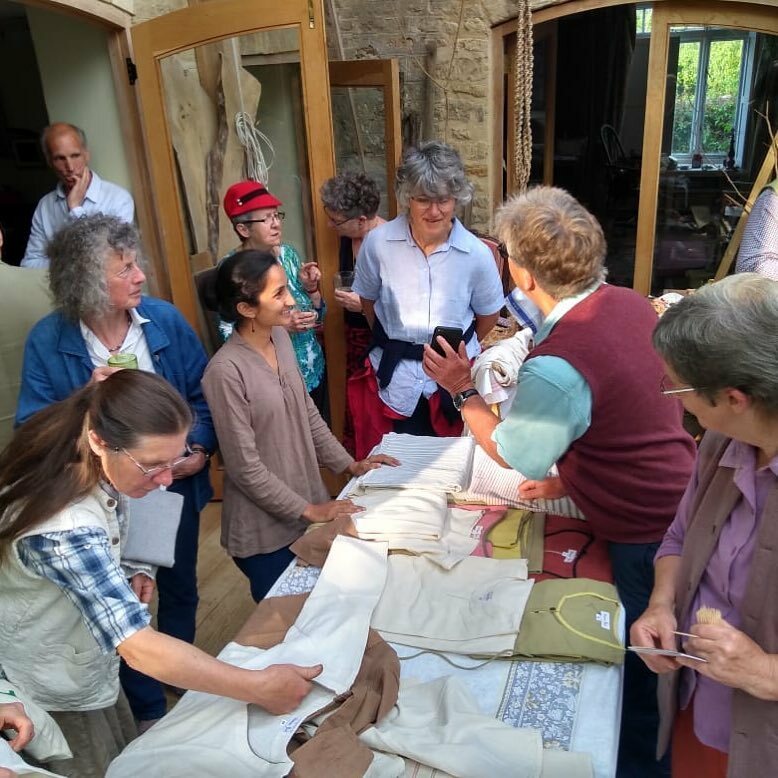 They shared their experience of organic farming and organic khadi in various forums around England. Seema Singh, a Madhubani Painting artist on a family visit from Delhi, added to interest in crafts, which by then had already become a part of Khadi Initiative’s agenda. Seema Singh demonstrating her painting skills to Alessandra and Francesca of No Serial Number Magazine. It was clear from the outset that the Khadi Initiative was not just about hand spun and hand woven fabrics from India. It was about change in our values as individuals and as a society. Khadi, and at broader level, natural fibres and fabrics, are a tangible way of expressing that change. 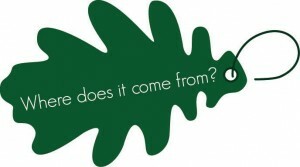 Ethical Brands for Fashion Revolution, an event organised by Where Does It Come From? and Ethical Hour in April, 2018 was a watershed moment for the Initiative. A panel discussion on fibres and fabrics, brought home the point that plastics in textiles and clothing had major inroads into fashion and were posing a big threat to our oceans and the environment in general. 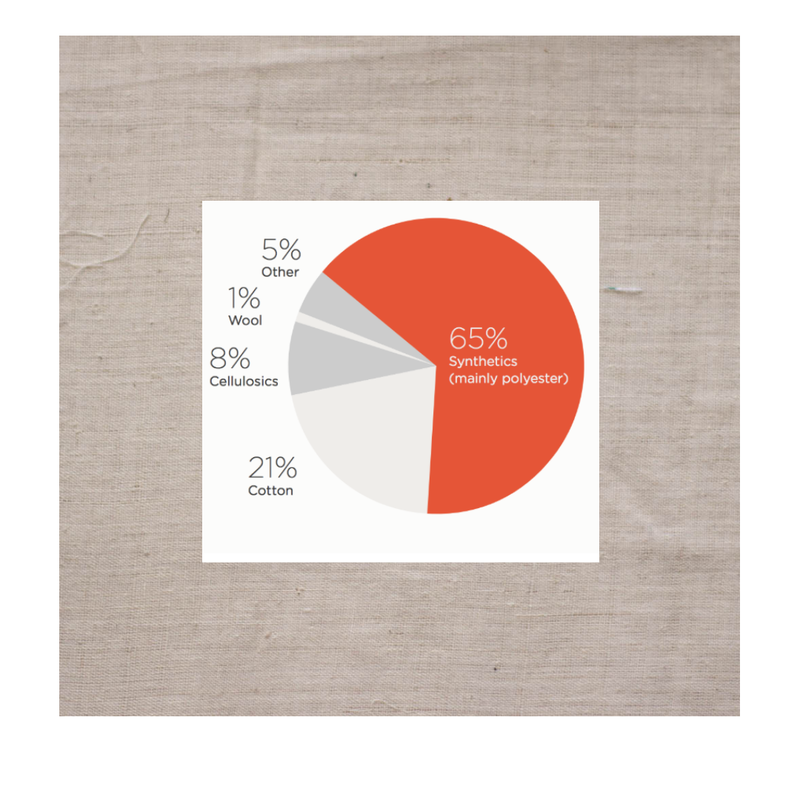 Synthetics dominate textile production. Not a good omen for people and planet as the following info-graphic shows. Forecast for 2050 if we continue with business as usual. 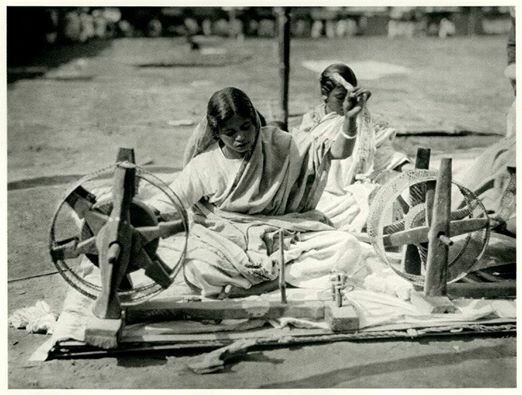 A spinning demonstration at the event sponsored by the Khadi Initiative gave a powerful and calming counterpoise. A demonstration of spinning cotton on a portable spinning wheel made popular by Gandhi at the Ethical Brands for Fashion Revolution in London in April, 2018. 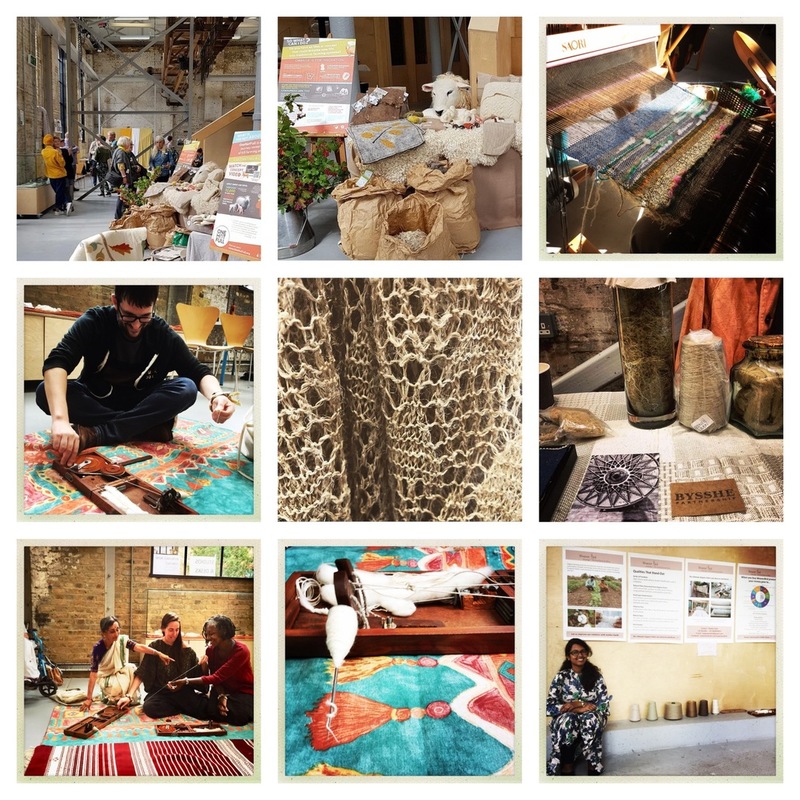 An idea was born – why not come together for a Festival of Natural Fibres? The Ethical Brands event was another important landmark for the Initiative. New connections were made. An idea was born! The time for a festival of natural fibres had come, a festival that would look for solutions. To search for how we as individuals can play a role in bringing about change – a change not just for fashion, but for how our economy is organised and society governed. The idea that ‘Fashion can be a Force for Good and a Vehicle for Change’ caught people’s imagination. And soon we had over 30 businesses and organisations come together to plan and pull of a successful event. Research emerged as one of the priorities that emerged as one of the priorities if production of ethical and natural fibres was to be scaled. As Henry Palmer of Bysshe Partnership explained, large scale production of hemp fibres and fabrics in UK stopped about a hundred years ago, and therefore a challenge for hemp which had demonstrated environmental benefits to compete with other fabrics using technology from a century ago. Wool found the pride of place in the exhibits in the main hall, with Paula Wolton of Onehutfull creating a very a very real feel for the process of wool production from farm to fabric. 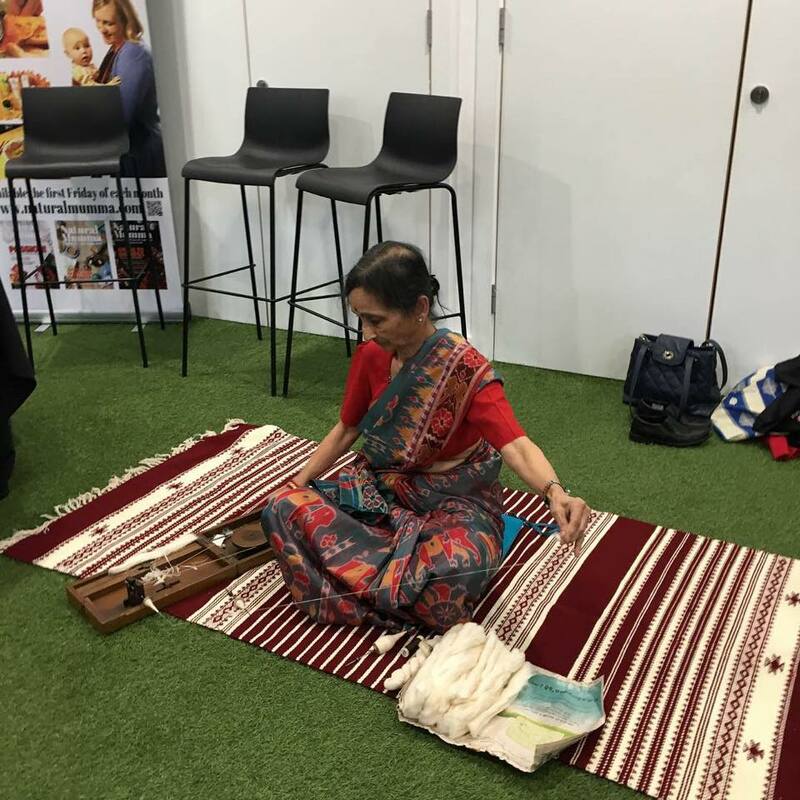 A live demo of bridling wool took place and an introduction of and demo of Saori weaving with natural hand spun silk from Odisha, India and organic khadi added to the effect. Just a glimpse of what was happening at the festival. Away from the main hall visitors were fascinated by displays of flax, hemp and nettle in business stalls. 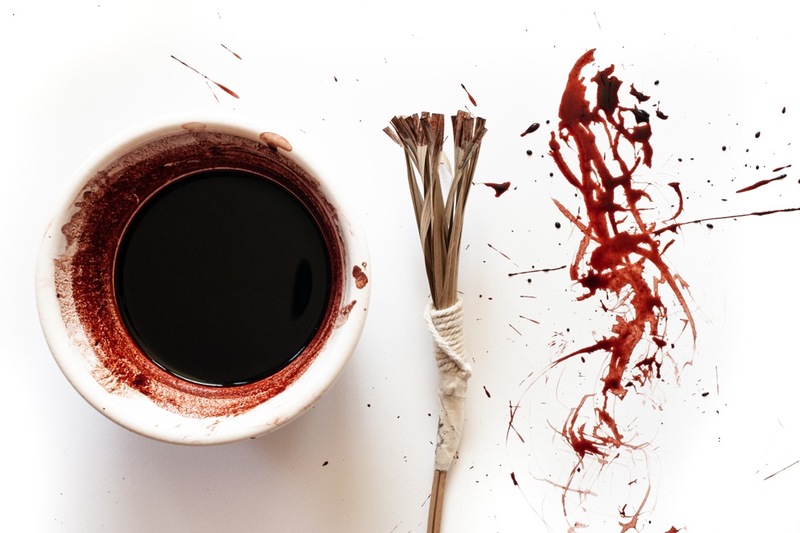 Workshops in which participants could create with natural materials such as in a workshop in botanical inks, hand made brushes and khadi paper by Ross Belton of Modern Eccentrics and a nettle workshop led by Tallula Bentley. Both workshops were a hit. Two more workshops, both on Saori weaving were led by Erna Janine. Cotton continues to be the king of fibre and found a prominent place at the event. 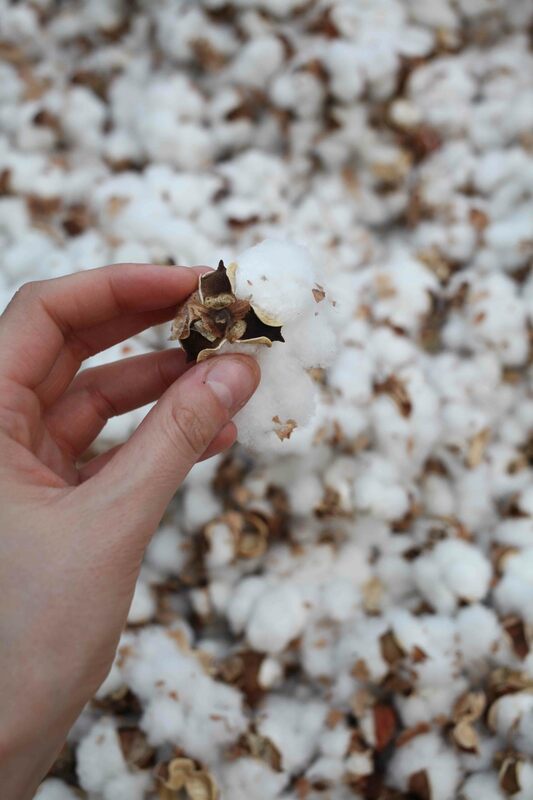 The chequered history of cotton as a crop, a fibre and fabric was well depicted by a photo essay designed by Divya Venkatesh of Stationery Treasure. The exhibition showcased the history, philosophy and benefits of khadi. Christa Suter, the CEO of bioRe Foundation set the tone for a discussion on challenges facing the production of organic cotton in today’s India, with the major risk coming from GM contamination in organic seeds. 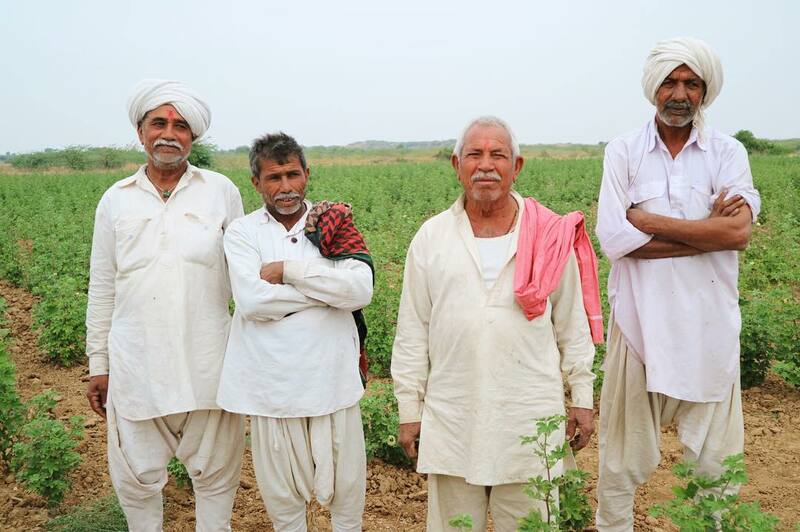 About 95% of cotton seeds in India are genetically modified, popularly known as BT cotton. As a result corruption in certification is not uncommon. This led to a discussion of other alternatives which can be as powerful, perhaps even more – reputation, story telling and a direct experience of the supply chain. Christa acknowledged that contamination was not, as yet, a major issue in Africa and cautioned that this may not remain the case in future, highlighting the importance of campaigns. Issues around scale, the demand for minimum orders by suppliers and of the importance of aesthetics in the fashion market – of the need to be continually creative in designing for ethical and responsible markets were also discussed. Asha Buch and Kapil Shah gave a live demonstration of spinning cotton on a portable spinning wheel (charkha). Inviting viewers to give the charkha a try and talking about the way of life khadi represented as they spun, Asha talked about simplicity as being an integral part of the khadi way of life. 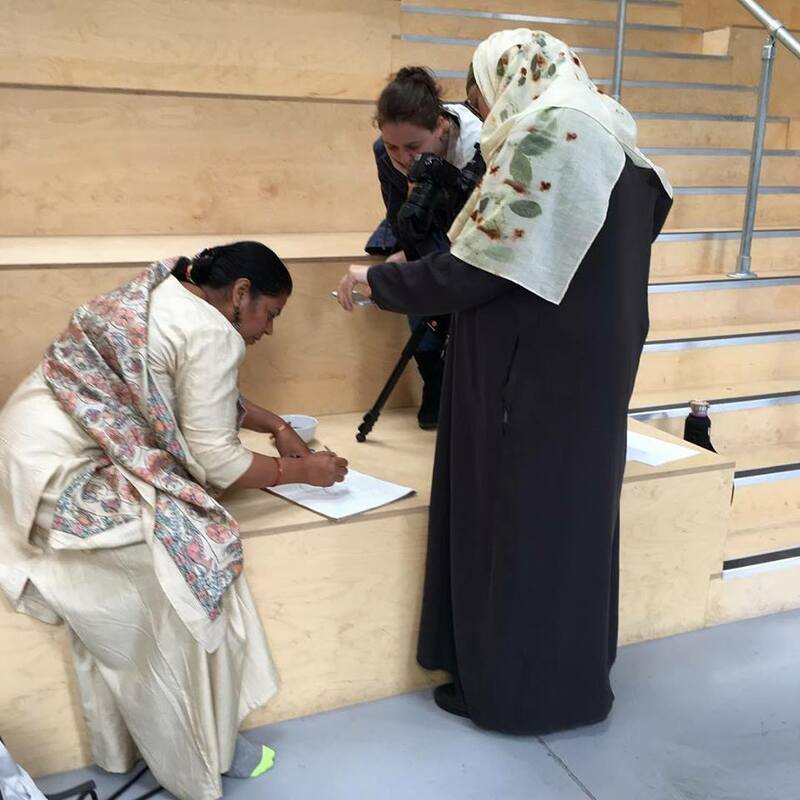 The demo followed a panel discussion on the ‘khadi way’ – on the values represented by Gandhi’s fabric – values of cooperation, of localised production, of personally creating and crafting with matter, and of ethics and resistance. The event itself created with a collaboration of over thirty ethical businesses and where conversations and networking took precedence over marketing and preaching was a live example of the ‘khadi way’ in a contemporary context. Q & A session on the ‘Khadi Way’. There was an important discussion on how to move forward with the Khadi Initiative which had helped create this open space. There was a general sense at the meeting that the focus should be on providing physical and online spaces for experience sharing, dialogue and network. There were specific suggestion for creating a directory, an event calendar and a resource listing. 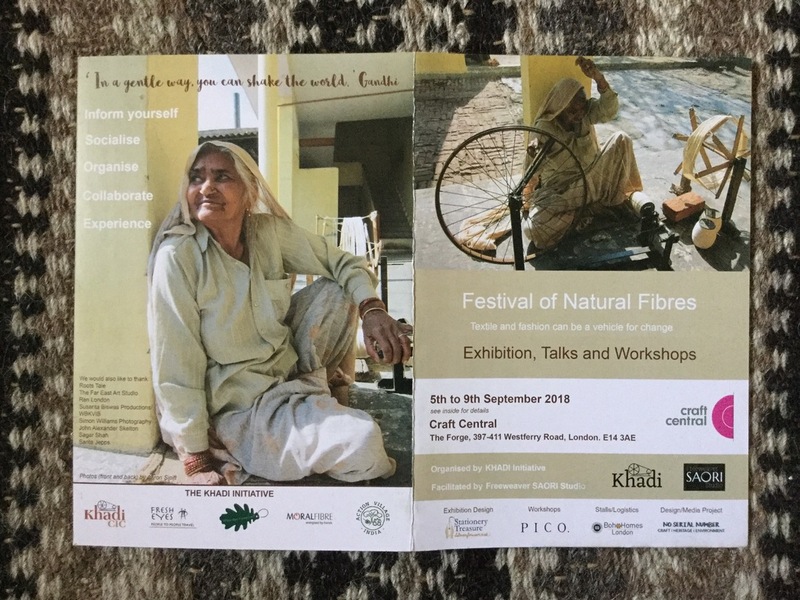 Shailini of Moral Fibre Fabrics announced a khadi event to be held in India as a follow up to AWA:EK, the khadi event at the Fashion & Textile Museum held in November, 2017. Plans for organising ‘Field to Fashion’ tours around this period were also announced. The day ended with a telling note from Kapil Shah – we are sawing seeds for ethical fibres, let us nurture them with care, patience and vigilance. 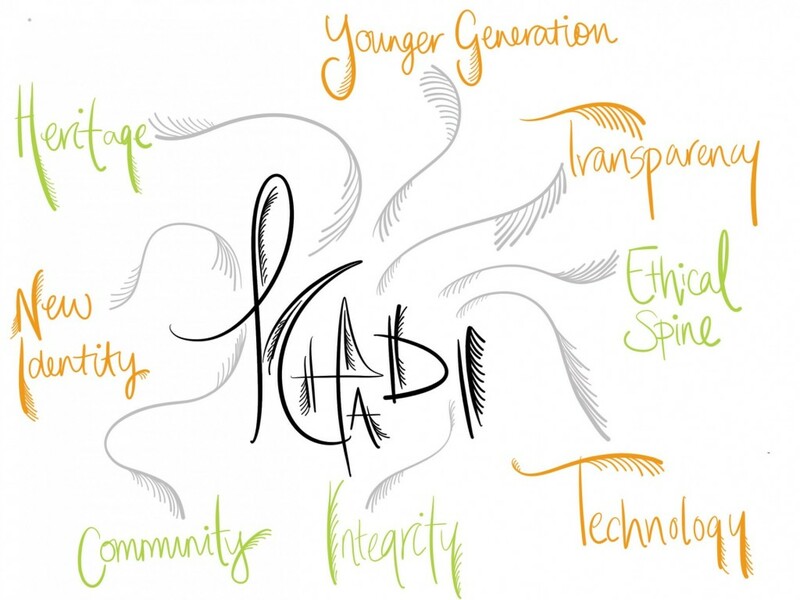 To stay informed about future plans of the Khadi Initiative, please subscribe to our Newsletter. Get creative: Khadi is an exciting fabric. Experiment with this ethical fabric in your next fashion endeavour. Get active: Contact us for volunteering. Watch this space for information about creating a directory, an event calendar and a resource list. Head over to Instagram to see and be part of the story of khadi and natural fibres, join our community on Facebook or spare a tweet for khadi.